Orafti® Inulin from natural sources. Inulin-type fructans, such as Orafti® Inulin, occur naturally in a great number of plants and vegetables, though the chicory root is a particularly wealthy source. As it is extracted through hot water processing, it is of 100 % vegetable origin. After extraction, purification takes place in order to meet even the highest quality requirements, including those for infant nutrition. Orafti® Inulin is an ideal fat replacer and is easily incorporated in moist or semi-moist food products. Our fructans help create a creamy taste and similar mouthfeel to fat. This enables developers to replace part of the fat content of their products by Orafti® Inulin. – reduce the caloric value of products without compromising taste or texture. Orafti® Inulin also improves the stability of dairy mousses and foams. Orafti® Inulin is a soluble fibre which allows for easy processing without adapting or changing the production process. Our range offers a unique solution to formulations requiring high dosages of fibre when water availability is limited. Orafti® Inulin can be categorised into three main product groups: standard Inulin, long chain Inulin and Oligofructose-enriched Inulin. These ingredient types offer different levels of solubility, sweetness and fibre content. Our experts are keen on helping you identify the solution for your application. Above values are indicative and may vary per specific application and process. Digestive health is a wellness issue and awareness on the beneficial effect of dietary fibre is growing. Get a close-up of the science behind prebiotics and benefits on inner wellbeing of Orafti® chicory root fibres.Let our experts walk you through the technical and physiological benefits of our ingredients, market insights, consumer concepts and recipes based on top-level food engineering. Break away from the established pattern with naturally-sourced fibres and starches. Formulate fat-reduced recipes with highly stable ingredients that help create smooth textures and a rich taste. Let our experts walk you through the technical and physiological benefits of our ingredients, market insights, consumer concepts and recipes based on top-level food engineering. 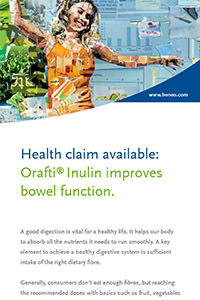 Health claim available: Orafti® Inulin improves bowel function. Learn more about the mechanism behind dietary fibres, market trends and recipe inspiring fibre-enriched fruit preparations. 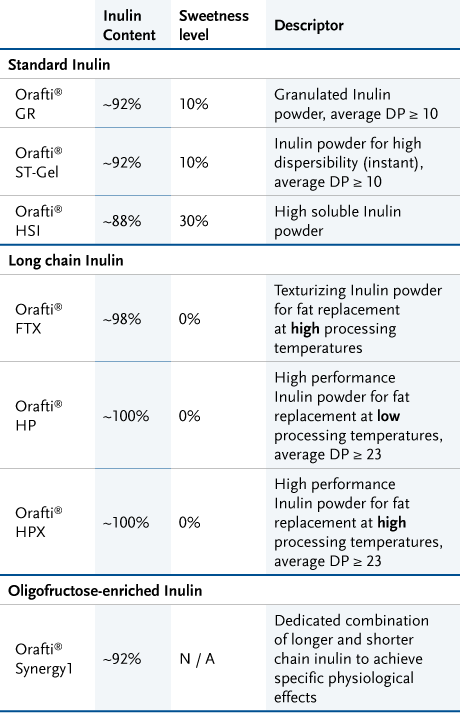 Get to know Inulin better.